JoJo’s View is all about embracing fabulous in life through celebration, gratitude and generosity! Joanne Neweduk and her special guests will inspire, educate and empower you with concepts, strategies and engaging conversations, designed to help you find clarity, transform your life, and Embrace Fabulous. 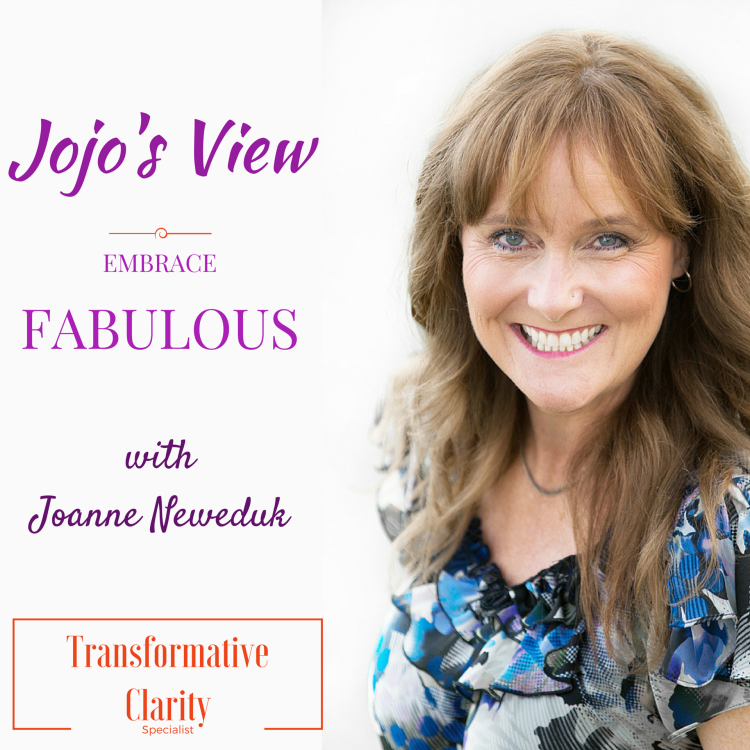 Join Joanne Neweduk – Transformative Clarity Specialist – for her premiere episode of Jojo's view! During this 30 minute show, Joanne talks about her own personal journey of Embracing Fabulous in life through celebration, gratitude and generosity! She shares her vision of CREATING a powerful community of women who have much to share with each other and in turn with the world. Join host Joanne Neweduk as she welcomes Dianna Bowes, founder of Fabulous@50, an organization that "Inspires, Educates and Empowers Baby Boomer Women". Listen in while they discuss all things fabulous including: Dianna's new book Fabulous@50 Re-Experience, the inspiration behind how she got started and what she has learned women really want. Visit www.fabulousat50.com for more information. He is a Master Certified Active Release Specialist and Life Coach with more than 25 years of clinical experience is highly sought after for his tactile sensitivity and ability to pinpoint and treat most soft tissue injuries with noninvasive surgical precision. As a clinician and coach, Gerard uses Functional Movement Assessments to evaluate his clients level of individual functional movement to determine a personalized treatment plan which best suits each individual. Gerard coaches those looking to embark on a new beginning in transforming their bodies and lives as well as athletes in training. What is Sound Therapy and the what are the benefits of a session? What's the difference between Music Therapy and Sound Therapy? At Sounds Within, located in SE Calgary, Ab. Sandy provides Sonic (Sound) Massage for effective stress reduction, relaxation and healing. The sound therapy process assists in harmonizing the frequencies of your body. Like tuning the instruments in an orchestra, every organ, system, or pathway resonates to its own frequency. So when you’re ‘out of tune’, sound therapy can help to bring your brain & body back into greater balance. Sandy D’Acey has been a Sound Therapy practitioner for almost a decade. Her love of music and singing brought her into the field of Sound therapy, and she has experienced profound results with the alternative health modality in her work with a variety of clients. We have all had emotional experiences or times in our life when we feel "Stuck in the Muck" Feeling weighed down with life is not a fun place to be. Our light feels as if it no longer shines. Join Host Joanne Neweduk as she shares her story of how washing off the mud can allow joy back in our lives. Bio-dynamic cranial sacral work has been used extensively in many countries around the world. It is now gaining recognition in North America and an extremely effective method to treat a multitude of issues. Join Host Joanne Neweduk as she welcomes Lorraine Ballantine to the show discuss and explore bio dynamic cranial sacral work. Lorraine specializes in treating clients who are seeking deep healing, pain relief, and gentle trauma recovery of all kinds whether physical or emotional. This quiet, deep therapy restores the whole system which includes the nervous system. She has 35 years of experience working with all ages in the field of counseling, teaching, Pilates, fostering and biodynamic craniosacral therapy. What are the 4 keys to personal safety? Why is it important to have a safety plan? What role does intuition or instinct play in a personal safety plan. Lorna Selig is the owner of the Personal Safety Training Company, Safe4Life. The mission of this company is to promote the concepts of personal safety to reduce the number of victims of crime in our community. In today's episode, Joanne is talking with Rosa Hidalgo-Galleguillos, Professional Organizer & Owner of "Neat to the Bone". What makes you a moving expert. What makes you different than a moving company? Rosa Hidalgo-Galleguillos was born in Antofagasta, Chile. She is a genius at at organizing people's spaces, home staging, and help people to get ready to move. In 2015, she founded her own company Neat to the Bone. Today, Joanne welcome Elaine Semkuley, co-founders of MMC - International Project. Elaine will be sharing her experiences providing foreign medical aid to the Burmese refugees. Today, Joanne welcome Elsie James,Country Director of Nepal, for the Calgary based charitable organization, Medical Mercy Canada. Medical Mercy is a non-denominational humanitarian service group working in the field of Health Care and Education with Burmese Refugees on the Thai/Burma and Thai/India borders, the Ukraine and in the tiny Himalayan country of Nepal. She will be sharing her experiences providing foreign medical aid to the Burmese refugees.